I've received a couple great trade packages here at the 2x3 home office, but in with those mails was another addition to the Pierce Project. I'll get to the trades tomorrow. 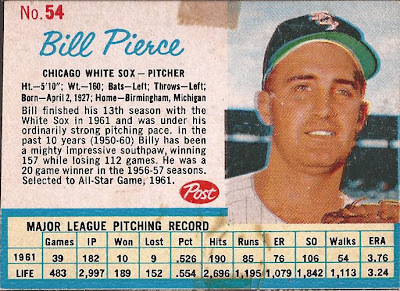 The newest addition is another of the "cards that would not be required to fill the set, but would pick up at the right price" purchase from eBay - only $3 for this one. 1962 Post Canadian. 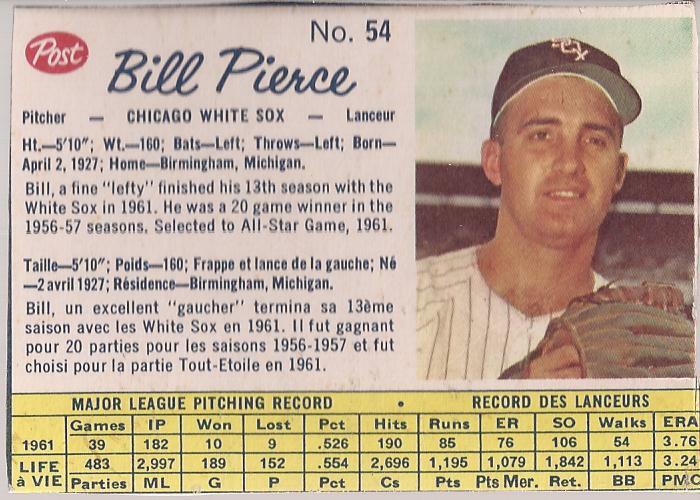 The other Post in the Pierce Project is the US version. So, let's put the two cards side by side, compare and score. Colors - US. 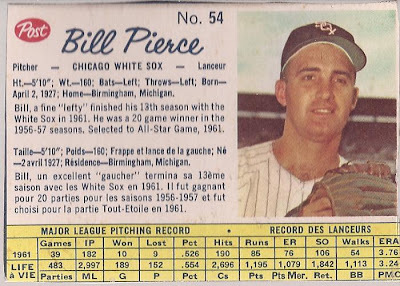 Even though the Pierce image is a bit blurry from misprinting, the colors on the US are more vibrant and the brighter blue stands out better, especially as a border around the stats. Image - Canada. I prefer the pulled back image on the Canadian version. Pinstripes, glove, stadium background - very nice très agréable. Write up - US. To handle the dual language card, Canada had to shorten the bio far too much. Also, is "lefty" some curse word up north? What's with the quotes? Stats - Canada. It was almost a push, but I am enjoying the dual language in this area of the card. Notice they don't play games, but have parties. Canada +5. Layout. US, but barely. I like that Pierce's image bleeds to the edge on the US version, yet the placement of the Post logo doesn't work. It's forced in that corner. Canada has a far better card number location, but because of the dual language, the Post logo rides too low. Plus the Canadian version has the white border on the image. If the logo was better, or they had an image bleeding to the edge like the US card, the neighbors to the North would have had this round. So in the end, the stats don't lie, with the US version beating the Canadian version 3 points to 2. More Post cards! Not postcards, but Post cards! Ponies, Pioneers and Ducks - oh my.